Well, whatabout ye folks. Me again back to fill your minds with more of my nonsense, lol. 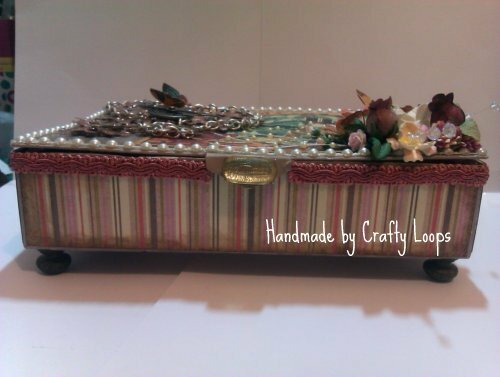 Today I want to show you another altered chocolate box I made. Heyyyyyy.......it was Easter recently remember! So I got a box of choccies from Scrubby......so no I am not a complete gorbyguts! Well......maybe just a bit when it comes to chocolate but anywho, Im not counting the calories so neither should you, lol. Anyway calories don't count if its a special occasion like Easter, Christmas, my birthday, Our Anniversary.....everyone else's Anniversaries, other peoples birthdays........Monday's, Tuesday's, Wednesday's........... are you getting the picture? Heehee. Anywhoodles, I am doing a Altered Box Swap with a fellow Youtuber and friend, Vikkie from Norway. Well no she is from England but now lives in beautiful Norway. We decided an altered box swap would be the perfect thing to work on as we both LOVE doing altered boxes. So, here is the box I made. 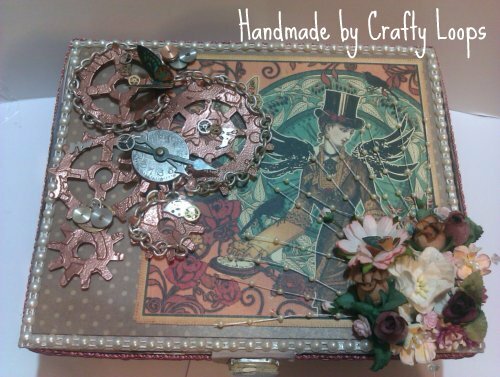 Now it is my FIRST EVER attempt at Steampunk so please forgive my amateurish work. I'm not completely happy with it if Im honest, and I don't know what it is that I'm not quite happy with but hey ho, I'll hopefully do better the next time if I ever do Steampunk again that is. Maybe Shabby Chic is something I do well and should stick to and Steampunk is the Genre that I will always love but have to admire from afar? Hmmmmm, who knows? 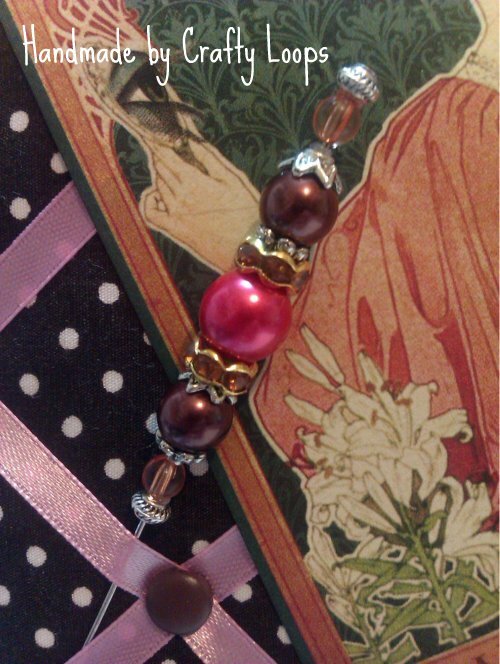 I wanted to use a colour scheme of pinks, browns and metallic colours. Here it is.......time for the arty farty deep meaning bit......heehee. We all know I'm as deep as a puddle, lol. The whole theme behind the box is Nature meets Industry. I wanted to have two distinct sides to the box. One side would be nature, filled with flowers and Butterflies and the other side with Industrial gogs and gears, chains and watch pieces. But the whole point is that I wanted Nature to meet Industry and show that both can co-exist beautifully together. I wanted the nature side of the box to be reaching out to the Industrial side of the box as after all.....nature is alive and the Industrial side although moving parts, its not actually alive. So that is why the wee pearl sprays from the flowers looks like its stretching and growing out to touch the Industrial side. 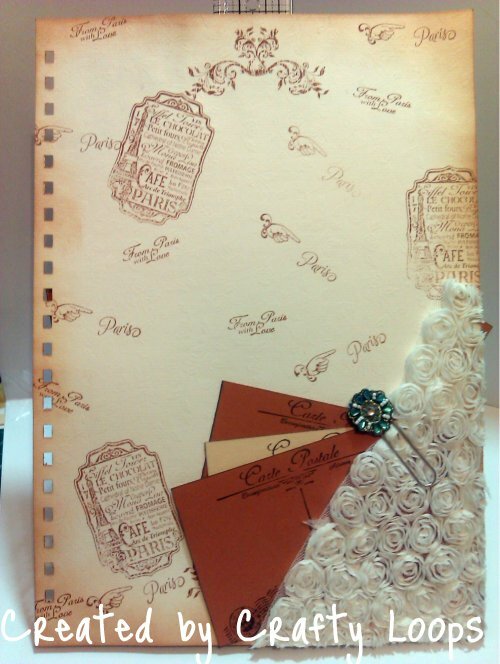 I also added fussy cut butterflies from the Graphic 45 Steampunk Debutante papers to add to both sides. 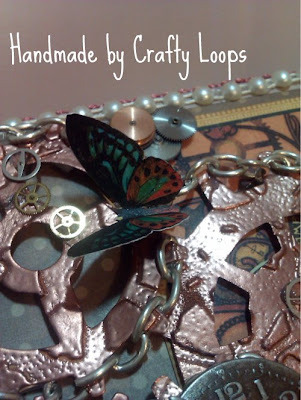 So with the butterfly on the flowers and one on the gears, they are the connection that brings the Nature and Industrial parts together. Sorry I can't remember this paper on the sides of the box, but I added it and used Walnut stain on all corners of the box and paper....they may be from the Graphic 45 pad.....but my sieve head has forgotten! The feet were coloured using the Umber coloured ProMarker. Its my first time not painting them but the Promarkers did a great job colouring the wooden feet. The closure is an amber coloured gem dismantled from an old jewellery piece from me old mucker Fiona (Jennings644 on YT and Etsy). 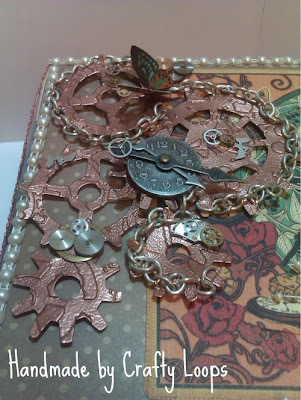 The Tim Holtz Gears were very kindly given to me by Maddy......Hi Maddy (she says waving frantically at her screen!). I don't have this die........YET! But Maddy die cut me some. I used the Tim Holtz Gears Embossing Folder sent to me by my lovely friend Bernice (Hello there!) 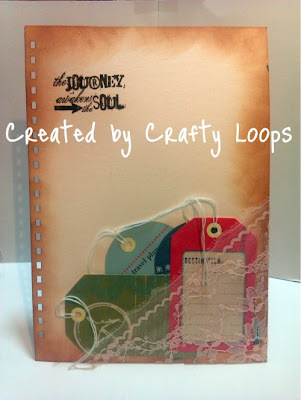 and I covered all the gears with versamark ink with a little help from the versamark pen too and I embossed them with Debbi Moores Cooper embossing powder. 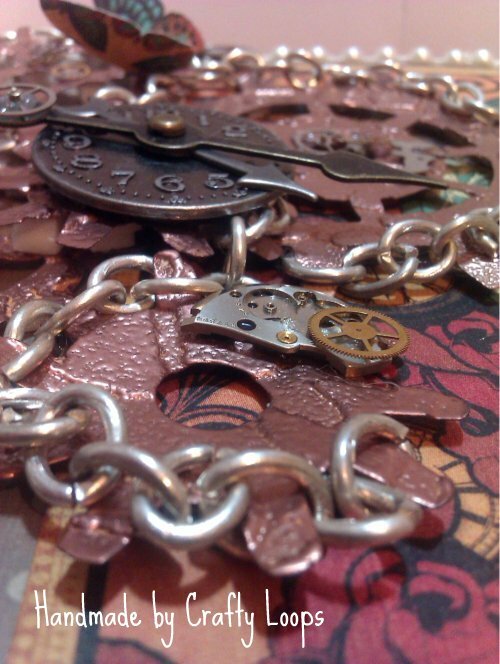 I got some old chains that I bought from Fi and worked them around the gears, gluing them down with hot glue. NOW.......this was the most fiddly and infuriating job of the whole box. 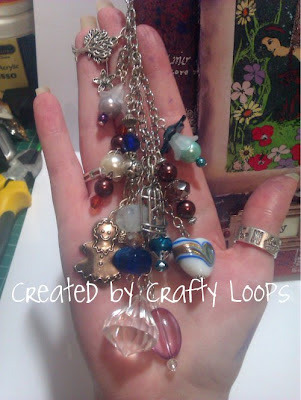 The air was blue in my craft room by the time I finished adding the chains to the gears. 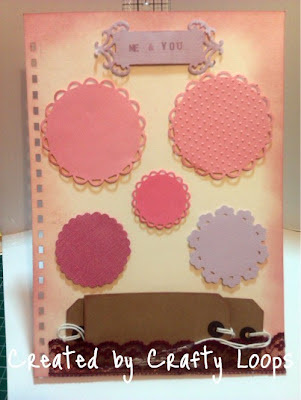 I had to set it down and walk away at one stage because I nearly chucked them all in the bin, I was getting so frustrated with it and as I dont have this die.....well chucking the die cuts in the bin would have been a daft move! The Timmy watch face and spinner came from Bernice also. 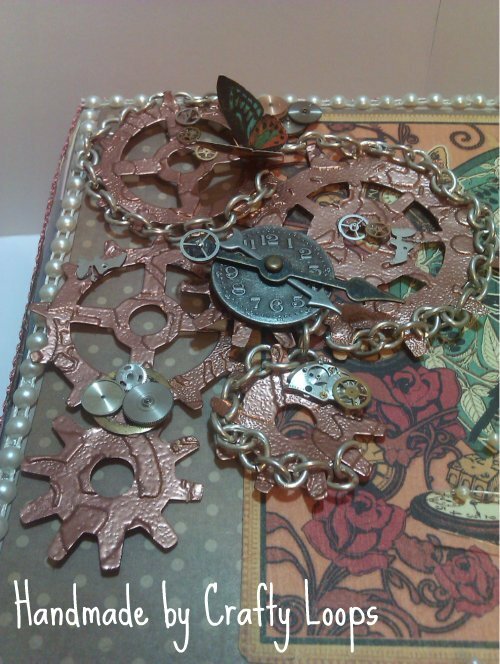 I bought some wee broken down watch pieces off ebay and added them to the gears and box. I also fussy cut one of the butterflies from the Graphic 45 Steampunk Debutante papers and added it to the gears. 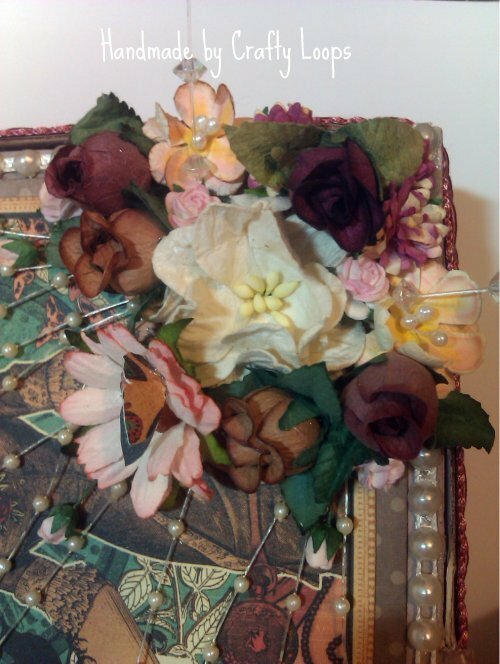 Here is a top view of the flowers. For once I used bought flowers! GASP! And some gifted flowers too. I know.....they arent all handmade by me. BUT dont panic.....do you see the wee Cherry blossoms (one of the right middle and one at the top middle of the picture).....they are made by me. Some of the wee rose buds are from Lindsay (LindsayCraftymonster81, thanks Lindsay) and others are from friends and some I bought. I couldn't do a project without some of my handmade babies on it. I also added some crystal sprays within the flowers. I added flat back pearls the whole way around the top of the box and coming from the flowers are some pearl sprays. Here is the inside. I just LOVE how the pin board came out. 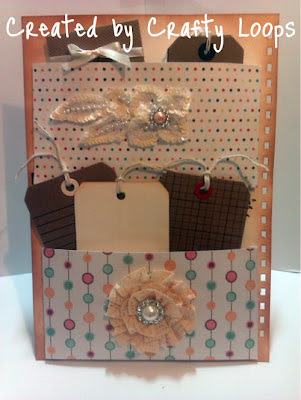 This is my FIRST ever time making a padded pin board and I love this one. 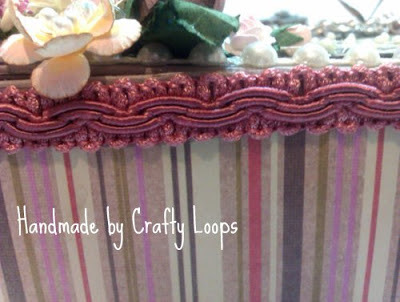 The fabric and ribbon ties in the browns and pinks on the outside of the box. 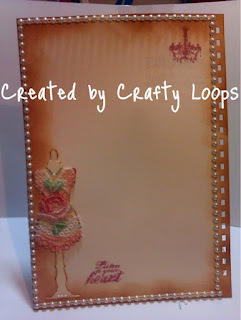 I do have a video tutorial on how to do this so it will be uploaded soon. I kept the bottom of the box simple as the inside cover is so detailed. 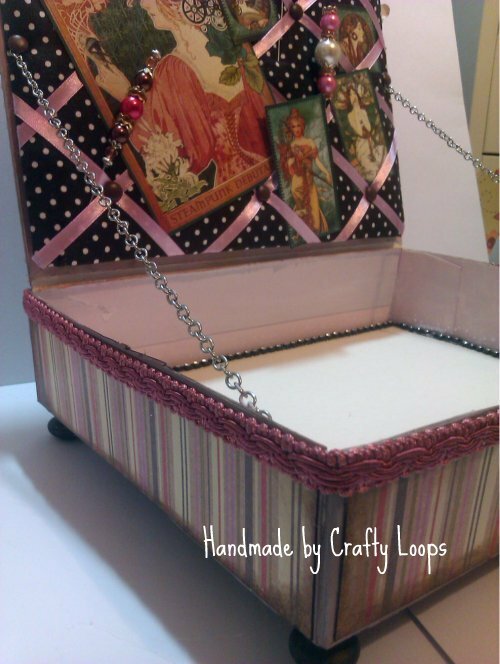 I added some more chain as a way to keep the box lid open. It ties in with the Steampunk feel of the box. 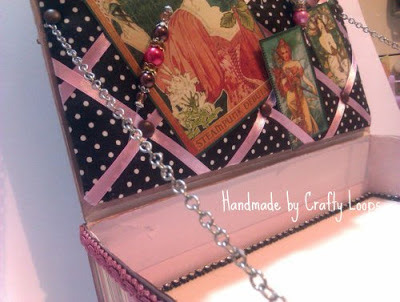 The chain is held on using brads in the side of the box and on the pinboard itself. The brads connecting the chain also helps hold on the pinboard to the lid. 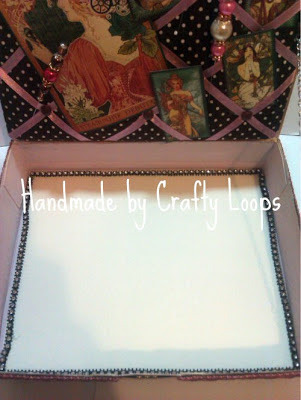 I added a piece of cream textured cardstock to the floor of the inside of the box and added bling mesh which I cut into strips and added it around the edge.....not too straight either as you can see, lol. And I had to throw in a lovely shabby chic stickpin! Well, I couldn't not add it, its so beautiful. 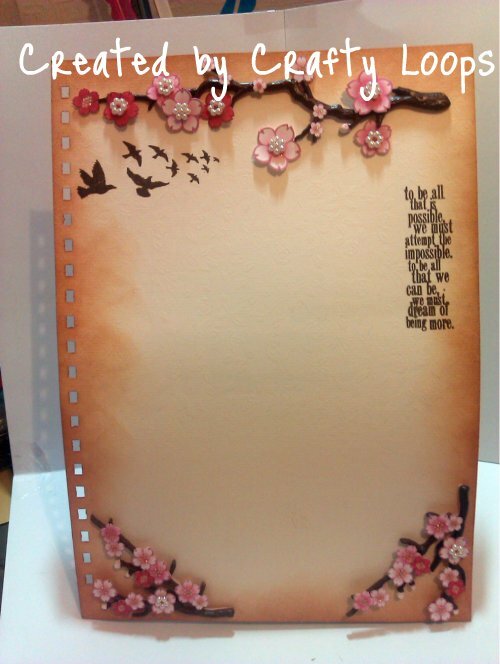 Holds 20 Distress Inks or a combination of Distress Inks and Blending tool thingies! Secondly.....She'll quickly jump onto Facebook to one of our cousins facebook page....Jessica (Hi Jess) and she may even text her too. She'll tell Jess to "Hurry up and get over to Lee's Blog......She's doing a real tutorial with her silly talking and everything!!!" Anywhoodles, enough of the lack of moral support from my very cheeky sister and cousin......on to the tutorial eh? Heehee. Nah....theyre all right really......they are as daft as me so I'm very proud to say they are a part of my gene pool, lol. I wanted something to store my distress inks in but wanted something that was going to take up as little desk space as possible as I have a teeny wee craft room. I decided to make a Distress Ink Tower as going up was a better alternative to going out where lack of storage space was an issue. So I made a tower out of chipboard and decorative papers. 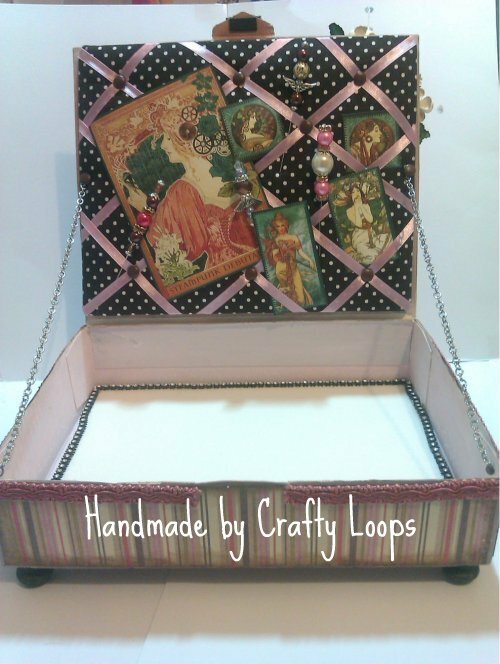 I made my first one nearly 2 years ago now......My word I didn't think I was crafting that long but its nearly 2 years now! But as the tower only holds 20 inks and I was at the Craft Show on Thursday, well I'm sure you can put 2 and 2 together and know that I bought more Distress Inks at the show. So I have now exceeded the 20 inks mark and needed to make another tower. Now I am sure there are better tutorials out there for storage of distress inks, but this is how I made mine. Here's the tutorial, any questions just give me a shout. DONT FORGET....IF THE ADVERT APPEARS, PRESS THE WEE "X" AT THE TOP RIGHT CORNER OF THE ADD TO GET RID OF IT. Enjoy. PART ONE .....sit back and have a cuppa.....this may take a while! See! I have no idea what those two cheeky monkeys were on about. 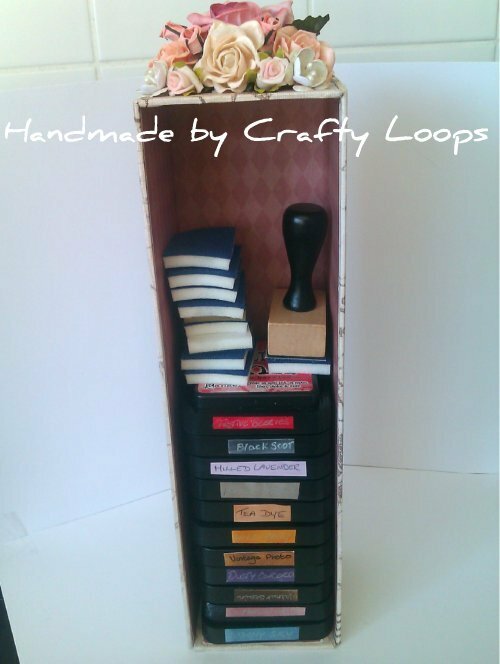 That was a perfectly fine example of a completely sane Northern Ireland woman doing a nice wee tutorial on how to make a box! And at no time was I giggling and completely amused by my complete lack of annunciation of words such as "Flower" or "Tower", lol. I even slowed down my talking for these tutorials.....not that you'd ever know as everyone from here speaks like the world is about to end in 10 seconds and we have a 100 page speech to finish reading out before the timer hits zero, lol. Well thats another bit of daftness over for today.....and look the day has only begun! I'm sure I'll have much more daftness in store for the day ahead.....isn't Scrubby a lucky man?! Well folks, hows she cuttin' as they say in my neck of the woods? I'm sure it originally comes from some sort of farming term...but in plain good ole English, that basically means "How are you"? 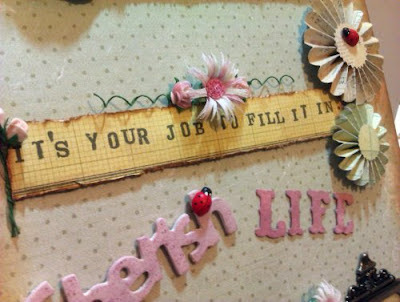 Well I had a wonderful day at the Creative Crafts Show at the King's Hall in Belfast today. And as my wee sister T is now dabbling in the wonderful Crafting World, there was little pleading needed when I asked her to come with me. Let's face it.......I need someone to watch over me in case I get up to no good and misbehave! Now I'm not saying I need a babysitter but......okay who am I kidding, my 21 year old sister needed to babysit her very badly behaved mischievous 32 year old sister! 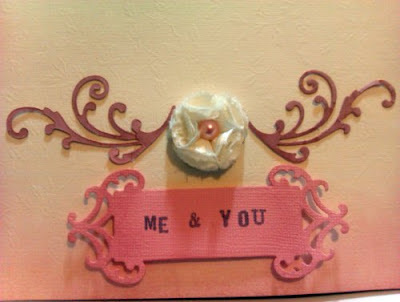 I even needed reinforcements called in so we met up with my bezzie buddy, Maddy from Izzwizz Creations here in Blogland. 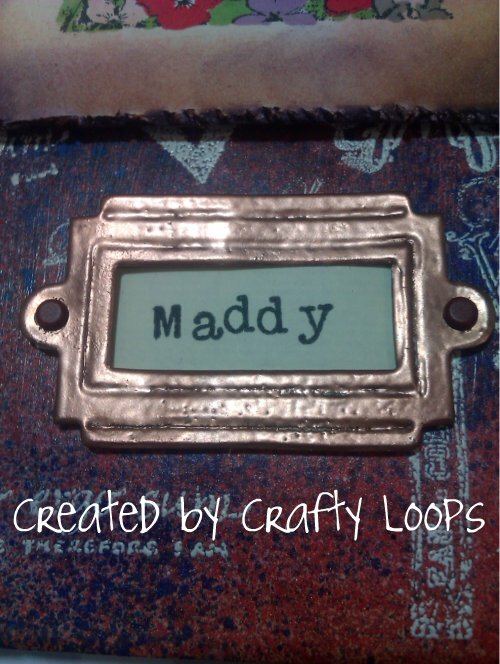 Please do pop along to Maddy's blog, she's an amazing crafter and artist and this month she was asked by Penny Black and more's blog to be one of their featured artists. So please run along and have a nosey at her beautiful birdcage book. Anyway, I was looking at all these Crafty ladies milling about the Kings Hall and all the while I was wondering did I know any of them from Blogland. 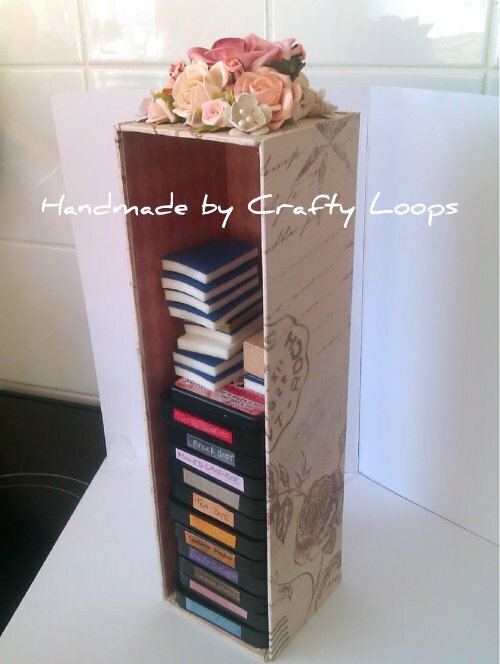 It was really starting to bug me and at one stage I really wanted to shout out at the top of my lungs "Oi YOU LOT........I'M CRAFTY LOOPS IN BLOGLAND. DO ANY OF YOU KNOW ME OR DO I KNOW YOU?" And as much as I would have loved to have done that, I would have run the risk of Tara and Maddy grabbing their bags (with T probably grabbing my purse in the process!) and then swiftly running off down one of the crowded aisles in an attempt to ditch me!! So I didnt shout anything, which was me totally fighting against my nature.....believe me! In fact.......the sensible thing to do would have been for me to have come on here on Wednesday night and put up a post saying "NOTICE TO ALL BLOGLAND CRAFTERS GOING TO THE KINGS HALL TOMORROW!!! If you want to know who Crafty Loops is and wanna say hello.........just look out for the 5ft 9", 21 year old skinny runt with bright VIOLET hair........and Crafty Loops is the one trying to pretend not to be with her." Yes thats right, I picked my sister up this morning and she got into my car with BRIGHT VIOLET HAIR!!!! And I swear it wasnt that colour a few days ago! And to top it all off, she got more compliments from people at the craft fair about how lovely her hair colour was that I was actually starting to think that I must be colour blind and seeing some other daft colour from everyone else! So anyway, a great day was had by all. Way too much money was spend, my cheeks were sore from laughing so much and I feel like I have been tackled by the whole Irish Rugby Team (well, that may be a bit of wishing thinking on my part, heehee), but I had a fantastic day. On to my project. I wanted to have a wee pressie for Maddy for when we met up today and this project has been in my head for a couple of weeks now. So I decided to make her a journal. As you all probably know by now......I bookbind, so this journal is made from scratch. Im afraid the photos may be a bit higglety pigglety but blogger is playing funny blighters again. Grrrrrr to the new blogger interface. They really need to iron out the severe kinks in their system. I had to use IE to upload the photos as I couldnt do it in Opera!! Anyway.....Enjoy. 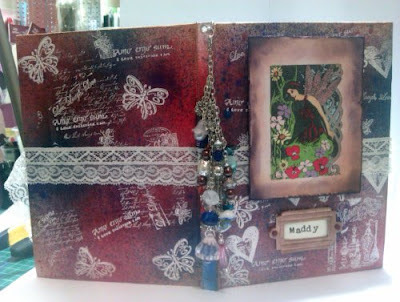 All the stamps I used on this book are Crafty Individuals Stamps except the butterfly stamp which is a Particraft stamp. 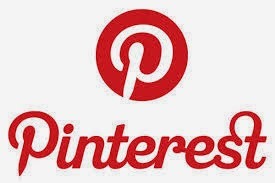 I will give the stamp numbers and links as and when I can. 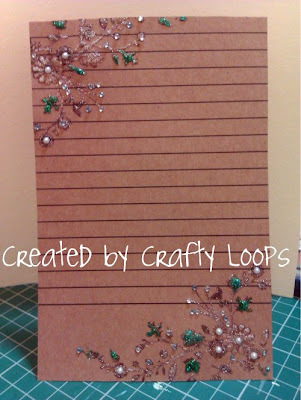 This Journal was made completely from scratch as always. 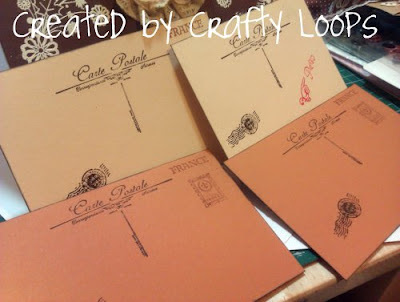 I promise my book binding tutorials are coming soon! She says for the millionth time! 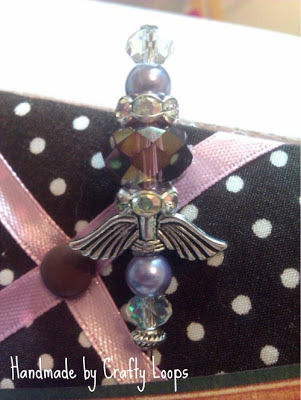 I always like to add detachable charms to my books, so they are part of the book decoration but can be removed and added to your handbag, phones, purse or even accessorize a belt or add it to a necklace etc. The flowers and beaded charms are made by me and then some beads and charms from my stash were added. 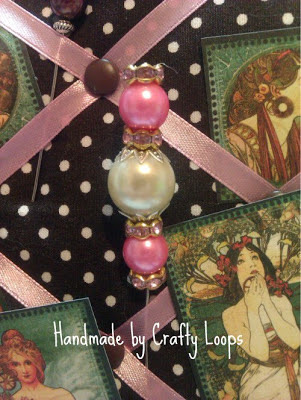 I love using different colours pearls when making charms and most definitely glass pearls are my preferred type to use. I tried to keep the colours of the charm relevant to the book colours. Side view of the book with the charm. 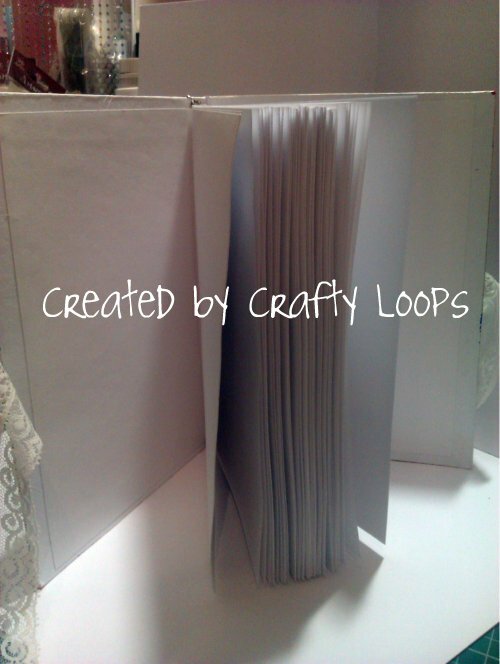 When I was binding the book, before I added the pages to the covers I used my Big Bite to add a hole and eyelet to the top of the spine. I added 2 large jump rings and then the charm has a lobster claw attachment so it can be taken off the book itself when in use. 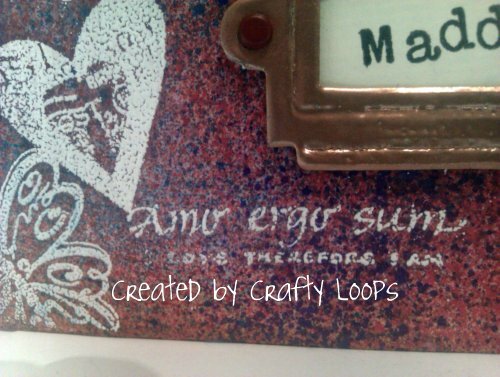 This is a freebie stamp I was given with an order I got from Crafty Individuals but if you want it yourself, its in the set numbered CI-341. 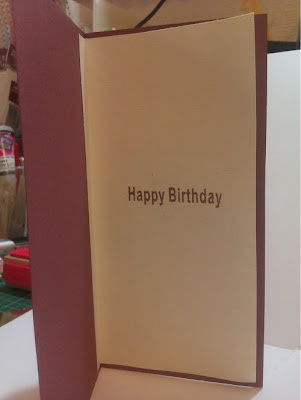 I decided to do the Embossing Resist Technique on the book. 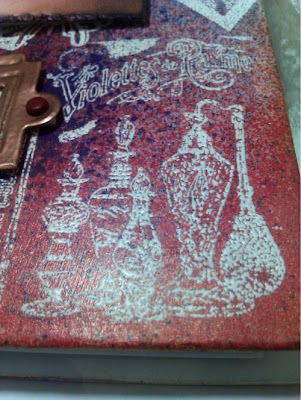 So I used my versamark ink and white cosmic shimmers embossing powder and stamped various stamps all over the books cover then heat set the embossing powder. I love the not quite perfectly smooth look to the embossing. Makes it look vintage. 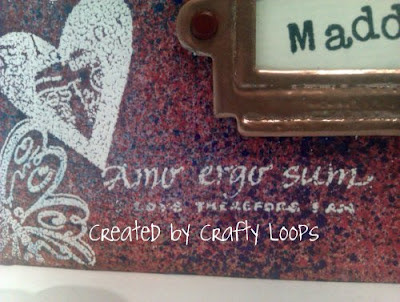 This heart was another freebie stamp from Crafty Individuals but Im so sorry, I can't find the code for it! 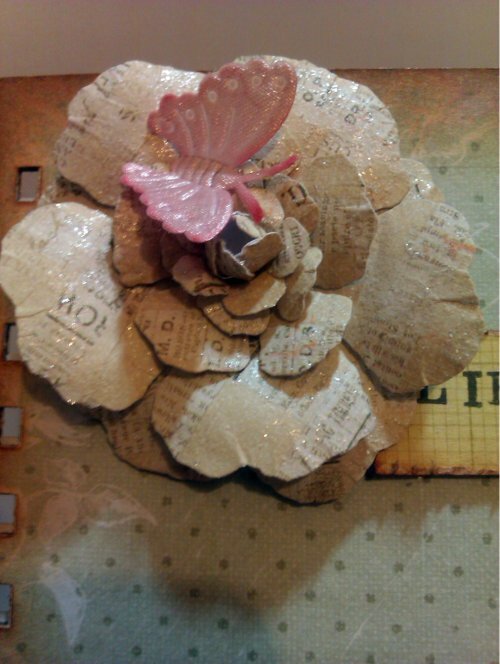 The butterfly that you can partially see is from Butterfly Set 2 from Particraft. 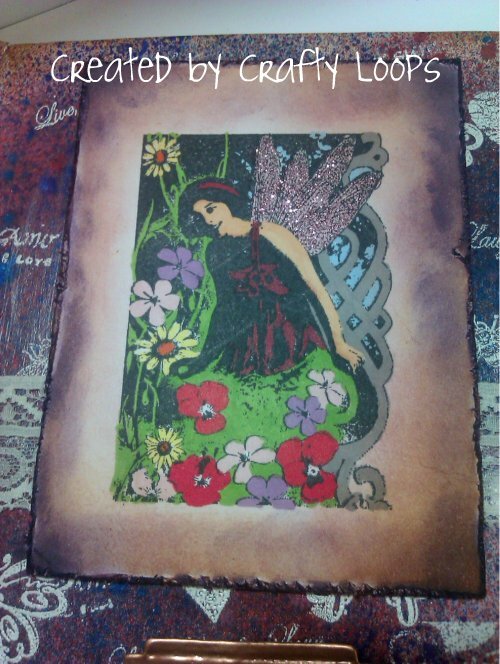 Once I embossed the cover with all the various stamps, I sprayed the entire book with a combination of Cosmic Shimmer Sprays and Tattered Angels Glimmer Mist. 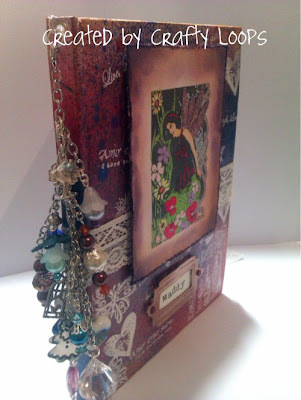 I stuck to blues, purples, reds and pinks for this book. I know Maddy loves bold colours so hopefully she likes these colours. 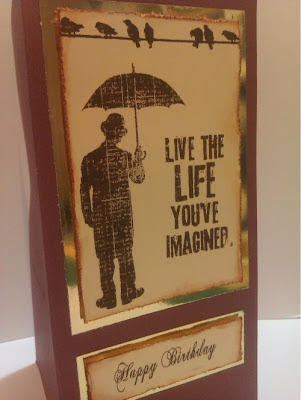 I die cut a Timmy Holtz Bookplate from Cardstock and then embossed that baby with Debbi Moore Metallic Copper Embossing Powder. 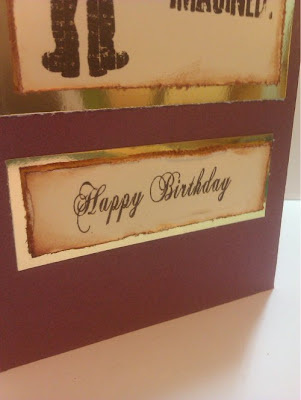 I added two wee maroon coloured brads to the bookplate holes. 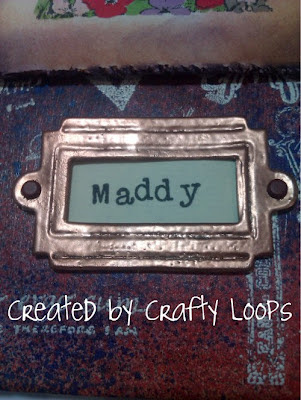 Now the stamping of Maddy's name was done with the wee wooden alphabet stamps that you can buy in the likes of Dunelm for £1.99. My stamping is in no way perfect or straight for that matter. Its hard to stamp those wee alphas straight......thats my excuse and Im sticking to it. But Maddy can remove it and add whatever she wants to the bookplate. I stuck the bookplace down with 2mm foam and only added it to the bottom half of the bookplate so the name section can be removed and replaced. This is the main image of the book. Again it is a Crafty Individual Stamp and its number is CI-132. NOW.....I am not a master colourer like all you wonderful ladies. I am useless at colouring, I cannot shade, I cannot blend.....in fact, if I stay within the lines I see that as a Masterpiece, lol. I used both Promarkers and Copics to colour the image and used some Dovecraft Glitter Glue to bling up her wings. 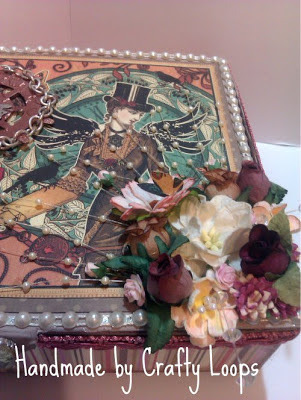 I then used my scissors to roughen up the cardstock edges and used a combination of Distress Inks on the cardstock, Victorian Velvet, Vintage Photo and Dusty Concorde. 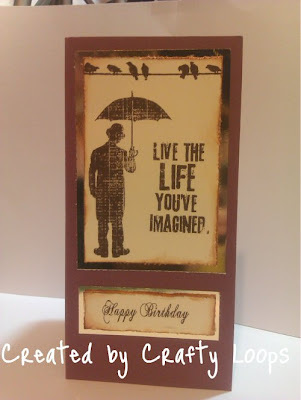 The image was stamped using Memento Tuxedo Black Ink and I must say, it is the best ink I have found to use with the Crafty Individuals Stamps. Their stamps are so beautifully detailed and Memento ink in my opinion seems to be the best ink to stamp all that stunning detail with. 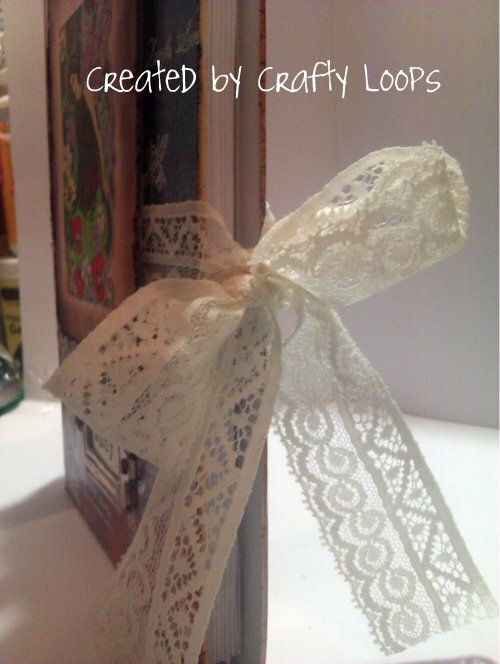 I decided to go for a lace closure on the book, so the lace was hot glued around the front and back of the covers and brought together at the opening of the book to tie in a bow. 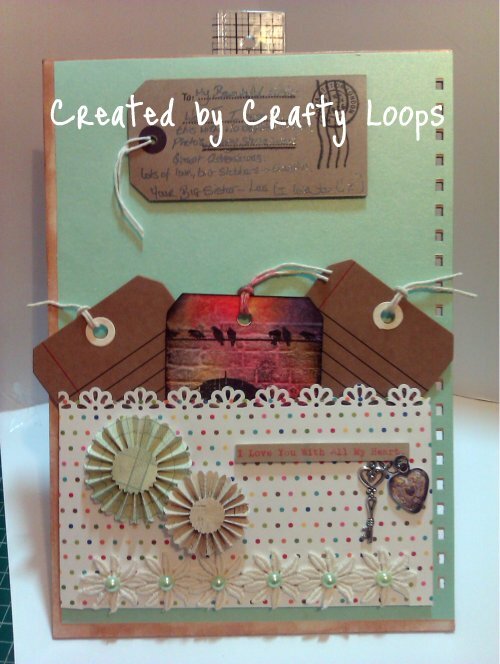 Here is a view of the inside of the book. once open. I left the inside covered completely white and blank so Maddy could splash them with her wonderful creativity. Here is a view of the lace closure with the bow untied. And thats it for this post folks. I hope you like this book. I won't tell you about the fiasco I had with the Cosmic Shimmer Sprays!! But anyone who has Cosmic Shimmer Sprays will know that even if you are using a brand new unused bottle, sometimes the spray part of the bottle either doesnt work at all, works perfectly OR decides that spraying straight where you want it to spray is so ordinary and boring. Sometimes a certain spray bottle decides its too cool for school and wants to spray in whichever direction IT wants. So there may have been an incident involving me pointing the purple Cosmic Shimmer Spray directly at the book, but said colour decided it wanted to spray sideways! I may now have a revolving carousel for my craft tools that used to be white, but now has a great big purple spray line of cosmic shimmers ALL down the front of it hitting every tool along the way. AND.....purple would not be one of my favourite colours! Grrrrr! CHALLENGES I'D LIKE TO ENTER THIS LITTLE BABY INTO! Clean and Simple Card and I want to introduce you to someone! Happy Birthday Bob-a-job! My wee Mamma calls my Daddy that! Well folks, whats the craic with you all? Firstly, BIG apology. Im using the new blogger interface (which I hate by the way) and I did turn the Word Verification OFF or so I thought! I went into it there now and it was still ON Grrrrrr! So hopefully word verification is now off again. I hate Word Verification, lol! So just a note to anyone who has gone over to the new interface....DON'T FORGET TO TURN OFF WORD VERIFICATION (if you dont want it on of course!). Anyway, Yesterday was my wee Daddy's Birthday. After three everyone......ONE, TWO, THREE........HAPPY BIRTHDAY LOOPS'S DADDY!!!! Or you can call him Bobby which is less of a mouthful. And in a completely unrelated subject.........it was also the 100th year Anniversary of the sinking of the Titanic!! And before you say anything, as far as Im aware, none of my ancestors worked on the ship at the shipyard, Harland and Wolfe in Belfast so don't go blaming me on it sinking......it wasnt my fault!! Bloomin' iceberg! Anywhoodles, no it isn't a mirage, also do not adjust your computer screens! Yes it is a real live card I am showing you, but it is not a great artistic masterpiece. 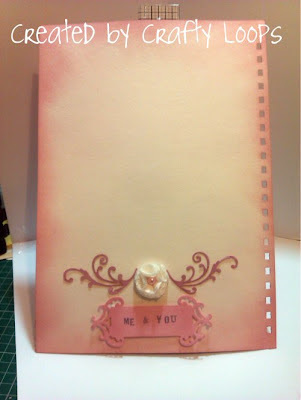 If I am going to be forced into a situation that entails me making a card.......its going to be as clean and as simple as possible. And I certainly think this card falls under that category. Anywho, the photos are below. Ha!!! I did it.....well kinda did it! There is no reflection in the top part of the mirri card but a wee bit at the sentiment. Ack well, it can't be helped. Now, onto a completely different subject all together. I want to introduce you to someone. If you are a follower of my blog and actually have the patience to read through my endless drivel, then you will have heard me mention my one and only sister (but I do have 3 brothers too), my wee T or Tara, to everyone else. 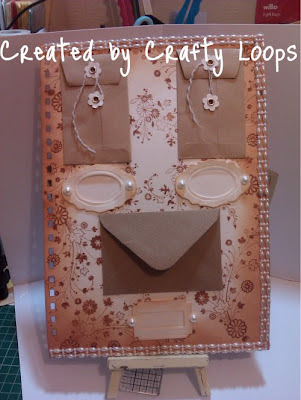 Well I have been trying for the last year to tempt T into getting involved in some sort of crafting. I've dragged her along to craft fairs, she has ribbed me endlessly about my crafting and calling me all sorts of daft craft related names; I have taken her kicking and screaming around the Craft shop in Belfast; I even make her look at every creation I make and stick my blog under her nose at every opportunity. 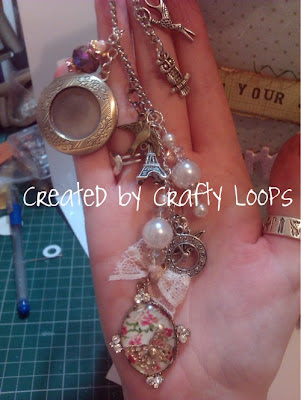 So sooner or later I was gonna break her and get her hooked on to some kind of crafting, should I have to hot glue her to my craft chair and tie ribbons all around her, chanting "You must make something handmade......YOU MUST MAKE SOMETHING HANDMADE!!". Well........(NB.....read the next part like the guy with the deep voice that does the trailers for movies).......They said it couldn't be done.....dum dum (The "dum dum's" are the drum beats by the way, Im so weird heehee).........They said she'd never lift up those tools.....dum dum......she swore she'd never become a crafty nerd......dum dum....This Summer, watch how one young woman struggles against the crafty odds to stop ebay buying, just to keep her bank account in Credit! 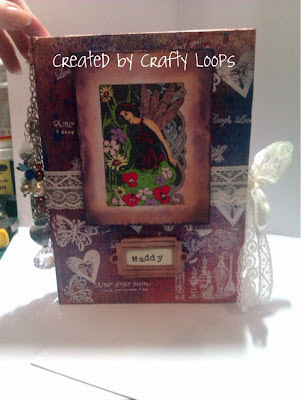 This Summer watch out for......Purdy Creations!!!!!! (big orchestral finish!!). Heehee...Yes I know, I know...........I'm wired to the big light as my Daddy would say! I am very proud to say that I finally got my wee T into crafting, in particular the jewellery and charm side of crafting. 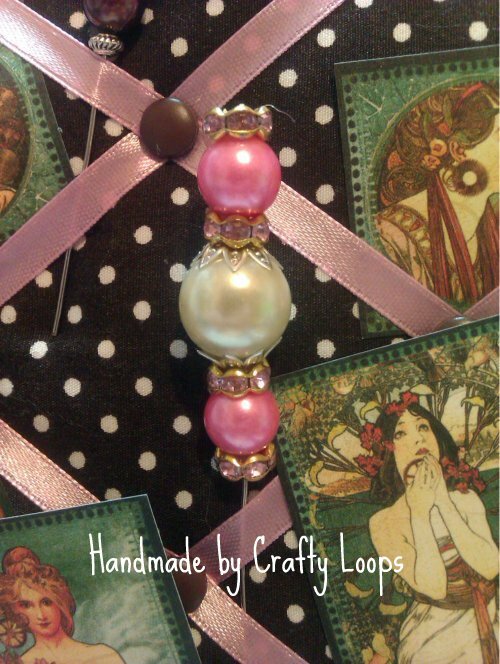 She called it Purdy Creations because, well that's our surname (well my maiden name now! I miss my name....blub blub!) and with the obvious association of "Purdy" meaning "Pretty", I think its a clever wee name she's come up with. She only started her blog yesterday, therefore she only has a few wee things up. So with herself and between me and Kathleen's Crafty Bloggers site she's slowly getting her wee blog up and running. 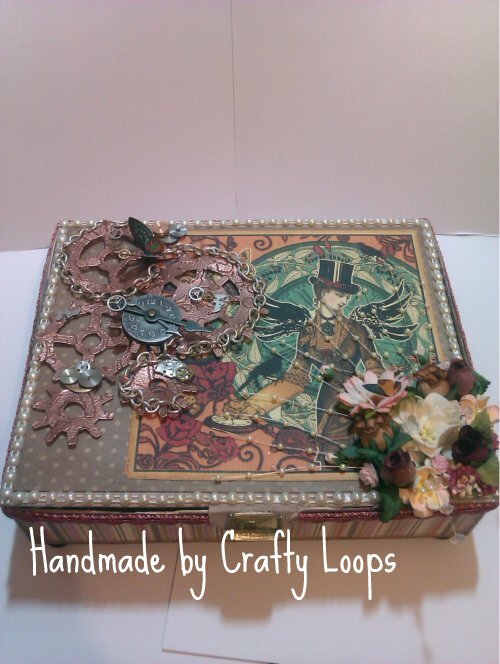 So, would all my lovely loyal follows mind terribly doing me a wee quaver, and hop over to wee T's blog, Purdy Creations and show her some love please? I would really appreciate it and I know T will too. You'll quickly realise that she has a warped sense of humour like her big sister! WHAAAAT????? I had to pass on something to my siblings! Anywhoodles, thats my lot for today folks. Nothing more to report.....Ohhhhh Im heading to the Creative Stitch Fair at the King's Hall in Belfast this week, all being well. Yippeeeee!!! Somehow I don't think I will have to do too much arm twisting to get T to come this time. Something tells me she will be spending A LOT of time staring at all the bead stalls! lol. And guess who the numpty is that will be buying her supplies and beads? Sheesh! Sometimes being the eldest sibling is expensive!! VERY PHOTO HEAVY. FOR THOSE WHO WANT TO SKIP THE PHOTO'S, I'VE DONE A WEE VIDEO AT THE END OF THE POST SHOWING YOU THROUGH THE BOOK. What about ye folks. Im back again! My sister had a very wonderful 21st Birthday, thank you to everyone who wished her a Happy Birthday. And even after me posting such an embarrassing story and photo of her in my last post, my wee T is still talking to me! I think after 21 years of having me as her sister, Tara has come to realise that I'm a bit of a nut, have no limits to what I will say or do and if there is an opportunity to create an embarrassing moment....well she knows I'll take it, lol. I decided I wanted to make her something that she could add to over the years. So, I made her a Junk Journal. They seem to be all the rage in the USA at the moment but they are slowly making their way over here. 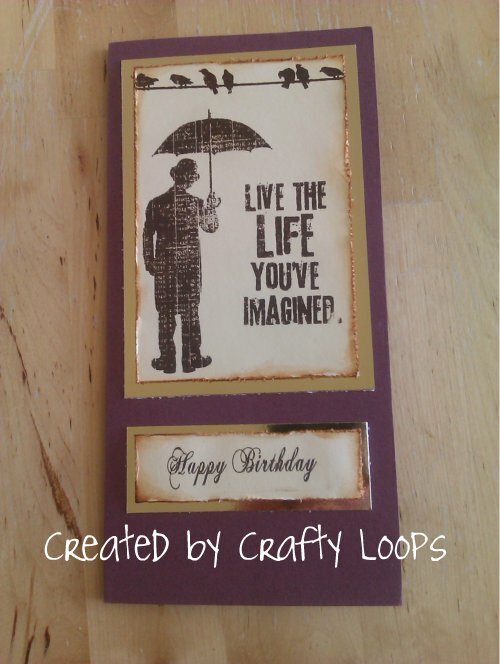 For those who don't know what a Junk Journal is, its like a notebook or album that you can journal in, stick photo's in, keep wee memories like cinema tickets in, wee notes from boyfriends or a funny sticker or flyer you saw. The point to them is that they are not structured layouts or pages like in Scrapbooks. 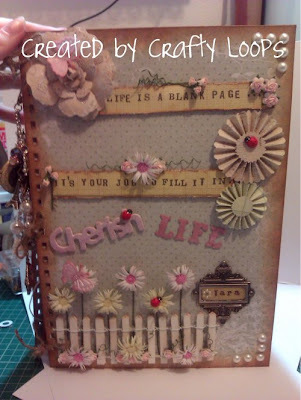 In a Junk Journal you can stick in whatever you want, wherever you want. Doodle on a page, write a diary entry, put photos of a night out with the girls in it or just fill it full of little things you've collected over the years.....its entirely up to you. 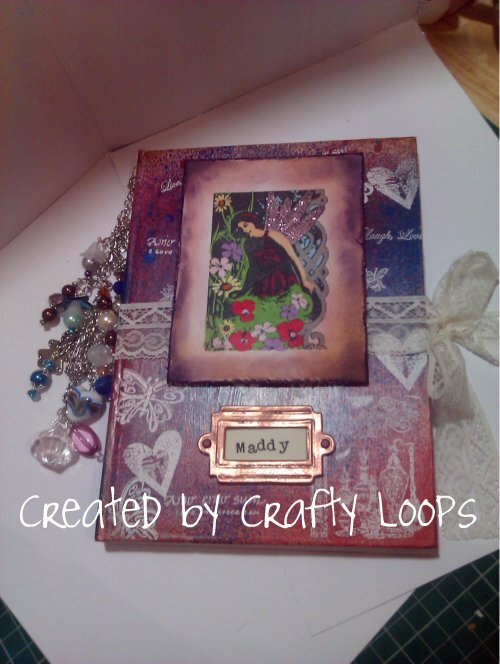 So this is what I made T. Originally I was going to bind it, using my Bind it All but it ended up a bit chunky monkey and I also wanted it easily unbound so she could add more pages to it in the future. So I used gardeners string and simply tied them in double knotted bows. 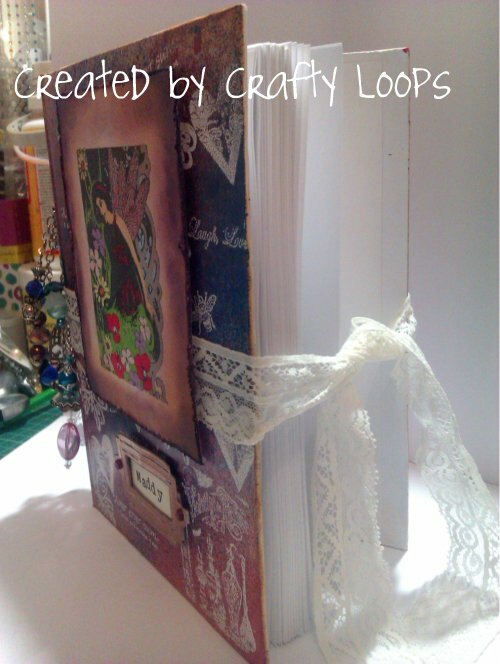 I show the photos of the pages I decorated only. 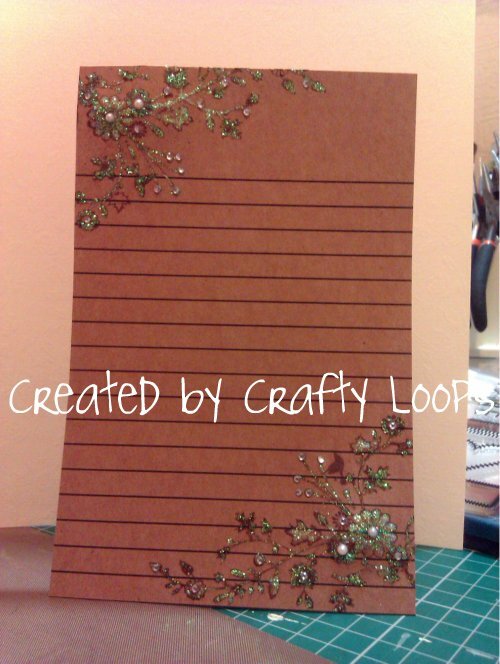 I added blank pages that T can add her own crafty touch to. I just LOVE the cover, I think its so cute and Fairy Garden Whimsical looking. The wee fence is wooden and very kindly sent to me by Fiona (Jennings644 on Youtube and Etsy). 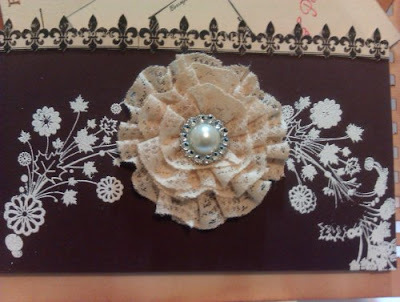 I added the wee flowers and then a Tim Holtz Bookplate with T's name which I got from Blitsy and made a wee pearly bling thing and just added Glossy Accents over it. I love this sentiment. I just stamped it on the paper with the wee wooden single stamps that you can buy. I think an alphabet cost me £1 for the whole set. 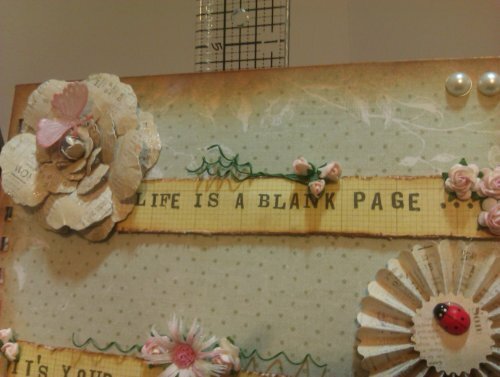 "Life is a blank page......its your job to fill it in. 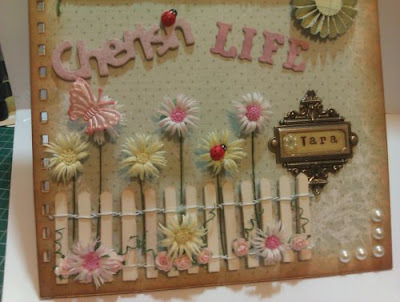 I also added a wooden "Cherish" on the page with "Life" which is the Tim Holtz Alphabet die cuts. 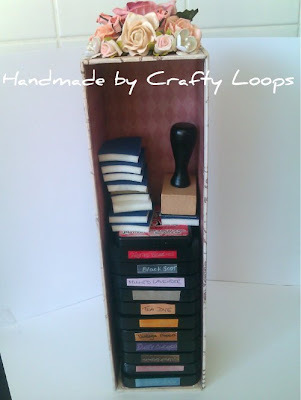 The wee wooden Cherish is from a lovely friend Tricia who is "alittleshabbychic" on youtube. She's an amazing and talented crafter. Check her channel out here if you get a chance. 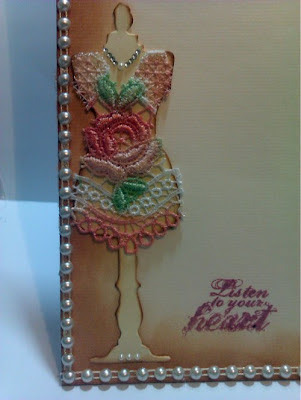 This is a flower I made from patterned paper using the Spellbinders Rose Creations dies. The wee butterfly is an applique sent to me from Fiona. 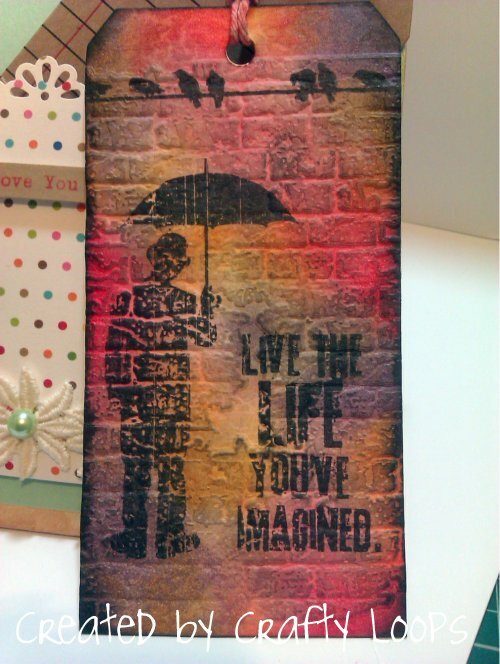 I sprayed it with Tattered Angels Vintage Pink spray. The flower was painted with Stickles. Inside cover I added a wee pocket that actually expands a bit. I did a mountain/valley sort of pocket so it expands out to fit plenty of tags etc. 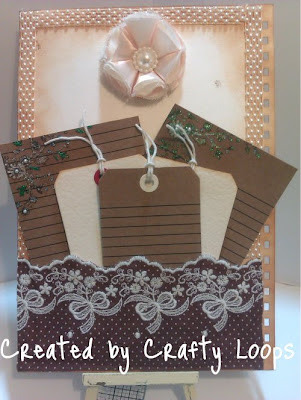 I used Tim Holtz Bookplate and Tag die to make the tags. Added 2 of my flowers with a sticker sentiment and a wee key and heart. I punched along the top with the Martha Stewart Doily Punch. The flower applique was again from Fiona. The wee tag above is just a personal message from a Big Sister to her wee Sister. Im so chuffed with this tag!! Its my first time EVER making one! On the back, I used a line stamp so she could journal on it. I made these postcards using the same french stamps (I mention the name of them on the video!). 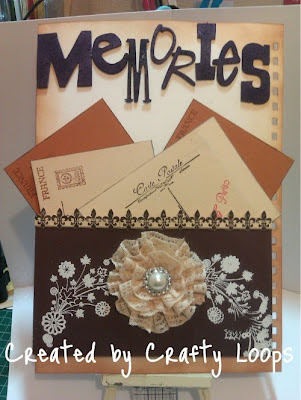 She can journal on these and then add photos to the back. 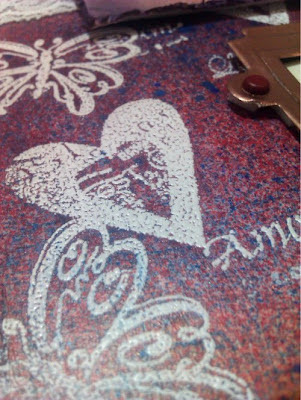 I really love the Tim Holtz Grunge Board Alphabets. My only gripe with them is that they are around £20 a pack so Im almost a bit peeved when I use them, lol. More postcards in this pocket. These are the postcards I made. I love these. 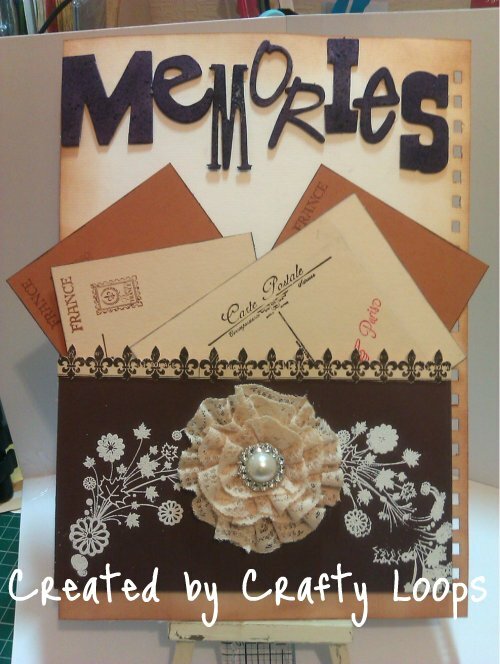 All made different sizes for her to add a number of photos or just one with some writing too. Or she can just stick stuff all over them. Its up to her! 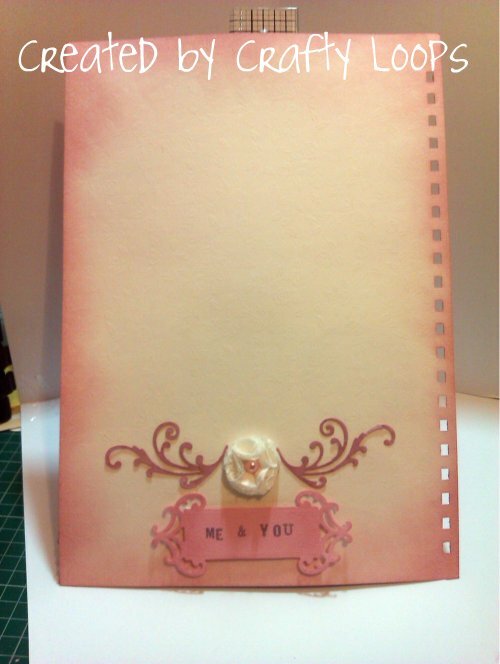 "Me and You" page which I left very plain. Its entirely upto her what she wants to do with it.....that is the point after all. I added one of my teeny Fluffy Goodness Flowers and a wee flourish and bookplate. I love these wee flowers, they are so dinky and cute. Perfectly small and great for any project as they are only around 2.5cm wide. Other than the cover, this is my favourite page. 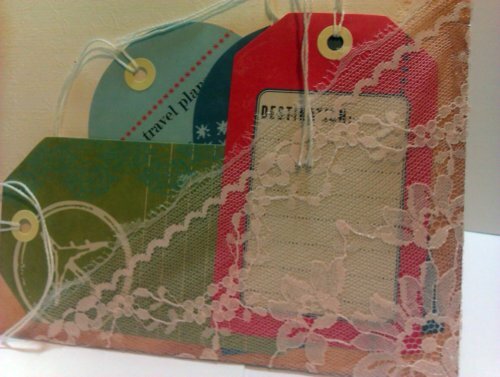 I stamped all over the page and distressed around the page with my favourite Distress Ink, Vintage Photo. 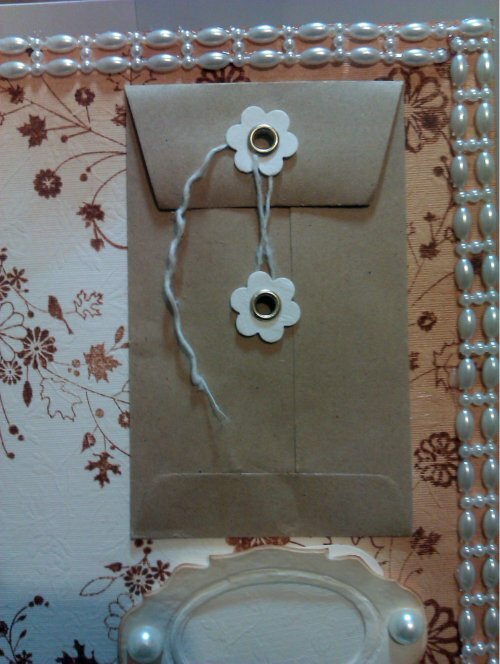 I added this beautiful trim and then 2 wee coin envelopes and a wee envelope. I think I said on the video the trim was from Fiona but its actually from an Ebay store called Diamante UK. Is it just me.....or does anyone else see a face on this page?? I added the eyelets and string to the coin envelopes using my Big Bite. 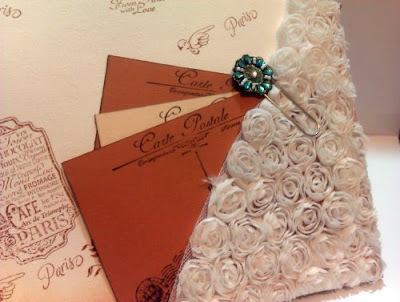 Under each is a Bookplate where she can write on the wee pull out tab and say whats in each envelope. This is again one of my larger Fluffy Goodness Flowers dyed with my own homemade glimmer mist. This trim was again from Fi! And I added tags and two Journal pages. 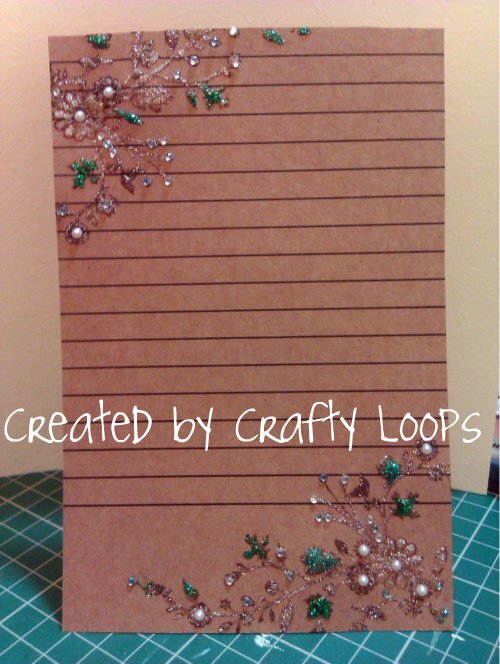 I added a flower spray stamp and added pearls, gems, green and silver stickles. Double pocket page with envelopes and tags. The bottom one has one of my flowers. The top is an applique from Fi with one of my flower centres. 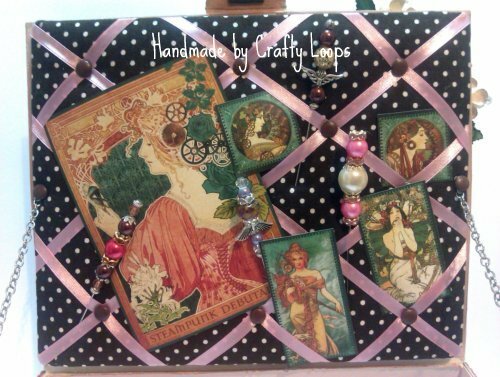 I love this border embellishment Fiona sent me. Its 3d and its so pretty. 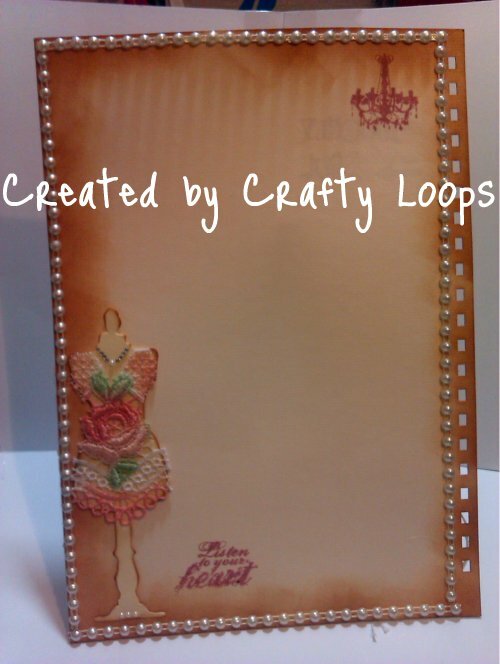 A plain wee girlie page with SaCrafters Flatback pearls and Tim Holtz dressform. I stamped a Timmy sentiment and Chandelier at the top right corner. The Tim Holtz dressform die covered with lace from.....you guessed it.....Fiona, lol. 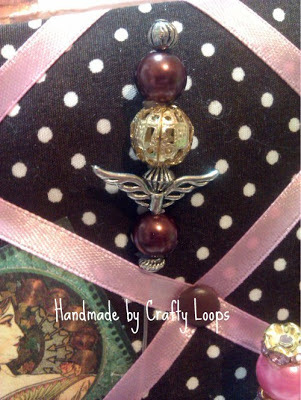 I added this charm onto the front using a swivel clasp so T can take it off and add it to her bag etc. The wee charms are from Maddy.....thank you Maddy, you're a Star! 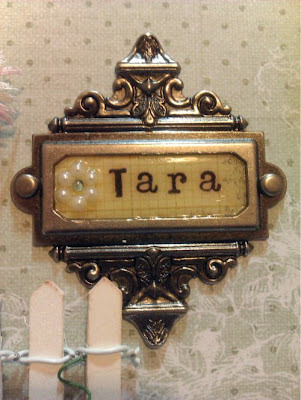 I made the wee pearl and crystals droplets and I added a wee locket and the gorgeous end piece was made by Tricia (alittleshabbychic)....thank you Tricia. Sorry for the blurry photo! 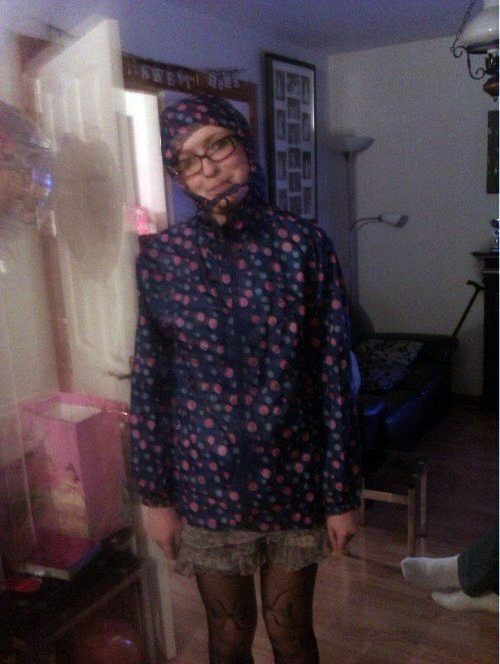 Here's the Birthday girl modelling the rain coat she bought for going to Paris! She is the spitting image of me in this photo! heehee.....not exactly complimenting myself there am I, lol. I really need to show you a sensible photo of my wee T, but they are hard photo's to find. Here's the video for all you sensible people who couldn't be bothered to read all of that above, lol. Thanks for stopping by folks. Thats it from now from me. 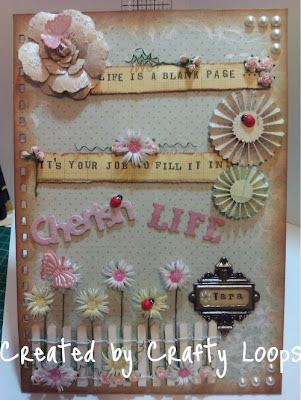 A wire spine Journal and the Spring Cleanathon!